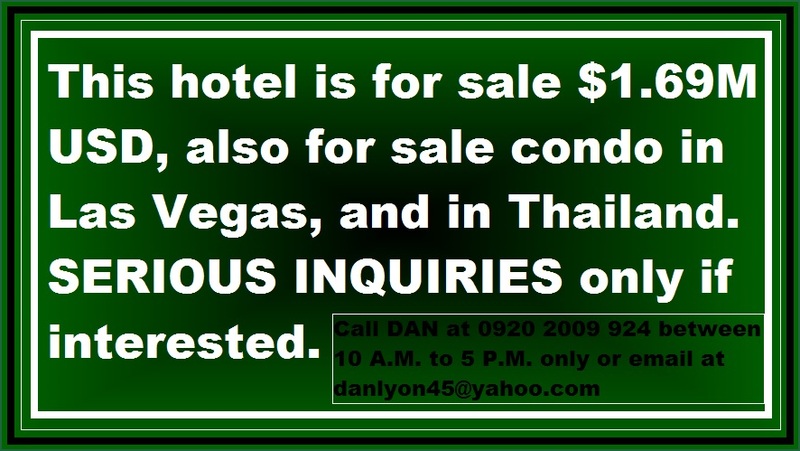 THIS HOTEL IS FOR SALE $1.69M USD, HOUSE IN LAS VEGAS, CONDOS IN THAILAND! SERIOUS INQUIRIES ONLY IF INTERESTED. DANIELAS PLACE is a budget apartelle, it is fully furnished studios with WIFI, internet wired and wheelchair friendly set to U.S. standards. All rooms on the ground floor has grab rails and shower seats. Rooms upstairs has shower seats too. Rooms have mini kitchen consist of worktop, microwave, fridge, air condition, fan and colored cable TV. We are not 5 star hotel but we offer great place to live in with an affordable budget price for everyone. We also offer free brewed coffee and little snacks in the morning. Feel free to ask our receptionist. For more details, our office number +63-45-321-0465. We at Daniela’s Place Apartelle feel very proud that we are right next door VFW. VFW POst 2485 in Angeles City, Pampanga, Philippines is an excellent place to relax with other veterans and enjoy an outstanding menu. The VFW supports an American Cemetery and provides surgery for needy children. Here in Daniela’s Place we have in our premises a washer and dryer and generator. We are ideally located with shopping malls and the entertainment district (click Angeles Bars and Asian Escapades) close by, just P8 pesos fare to catch a jeepney ride. 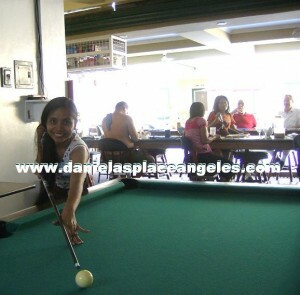 Our pool table, swimming pool, mini bar, and outside BBQ area offers a great place to relax, dine and mingle with other guests. We also have exercise bike and step master for free to use so you can to stay fit while staying in our place. You can enjoy people watching while exercising at the balcony upstairs. 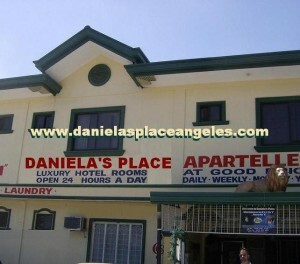 You can retire in the Philippines here at Daniela’s Place for less than $14 a day. For VFW members we offer 10% discount on our regular DAILY and MONTHLY rates. Feel at home, meet new friends, welcome to paradise, we’ll keep a light on for you. We are close to Clark Special Economic Zone, Bars and Restaurants. We are also stones throw away from the famous Blue Boar Inn where you can also enjoy full menu. The Blue Boar is known to be the hang out of “Harry the Horse” so if you need information that’s the place to go. We have different promo every month. Daily, Weekly, Monthly, Yearly Rates are available, ask management for more info. All our rooms are NON-SMOKING ROOMS, if you smoke, you smoke outside your room. NO PETS AND NO CHILDREN ALLOWED. Children may be allowed and must be with parents supervision. Where will I leave to the hotel on Tuesday, December 9, 2014. I want to know the price of the room to the one person in this period? Will the book value of the night Saturday, December 5 ? Hi Mohammed, we have rooms available. Prices are shown on this website. Thanks. I am interested in a three-week stay with you. Unfortunately, the flight arrives at 07:25 pm only in Manila. This means it could be late until I get there. Is that a problem? I’ll arrive there on Feb. 04, 2015 and remain untilFeb. 24, 2015. Can you make me an offer for a deluxe room to my Email? I would be very happy about it. Thanks in advance. Best regards Sveto. May 26? So 3 weeks and 3 days po. And magkano po ang aabutin niya? We have rooms available but we have no family room. Each room we have is good for 2 persons only with queen sized bed. I will be arriving approx 6.30pm at Manila Airport. Do you have Airport pickup from Manila? We have rooms available. kindly email us a week before your arrival.